Does a trail run in Iceland in a beautiful landscape with panoramic view over lava fields interest you? If so, check out the Pentecost Trail Race that will take place on Monday the 16th of May. The race starts and ends at Asvellir in Hafnarfjordur, approximately 10 km from Reykjavik. The Pentecost Trail Race has repeatedly been voted by runners as one of the best trail races in Iceland in recent years. It is very well organized with every little detail thought of, but it still has managed to keep the homely feel of a small local race. The race is organized by local running club Haukar and there are two distances on offer; 17.5 km and a 14 km route that is a slightly easier as it bypasses the biggest hill. The record time for the 17.5 km is 1:04 but many complete the run in around 2.5 hours. The course is on trails around a lake and various hills on the outskirt of Hafnarfjordur. The route is very well marked and there are many volunteers to assist the runners on the way. There are three drinking station and a DJ at three locations. All participants are rewarded with a hot soup after the race, and given a medal specially designed for the event. After the race, all participants are invited inside the sport’s hall so no waiting in the cold for soup and lottery draws! The registration fee is only £20 (ISK 3.200) and included is an access to Asvallalaug swimming pool with a nice hot tub to relax in after the race. The race is held in cooperation with Sportis, the distributor for Asics in Iceland. Two lucky participants who register before 1st of April or 1st of May, have the possibility to win a pair of Ascis running shoes. After the run raffle prizes will be handed out which include 10 Ascis running shoes along with other prizes. 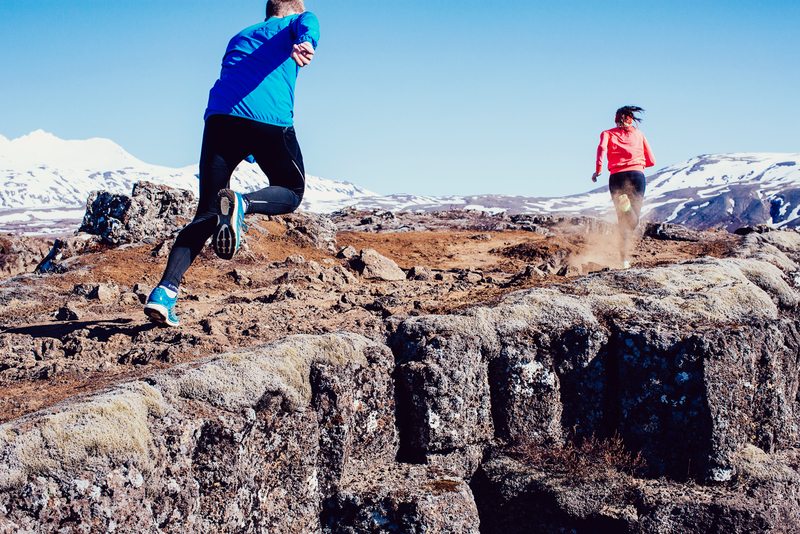 Haukar running club invites all registered runners to run with them on a 10 – 25 km trail run at social pace in the beautiful nature of Hafnarfjordur on Saturday morning the 14th of May. Iceland is only in two and half hours from England and most day there are more than 10 direct flights from UK to Iceland, (Icelandair, WoW, British Airways, Easy Jet and more). Here is a video from the 2015 run – it is only available in Icelandic but it shows well the great atmosphere of the race. For more information see the race homepage. You can register here for the Pentecost Trail Race 2016. More pictures on the Facebook page for Pentecost Trail Race.